I've gone back to reading Hopkins' distinctively odd poems, and once more I see the charm and force in his phrases. Somehow he captures the power inherent in words -- the power that has started all wars and all loves -- and I find myself getting swept away with the flow and tumble of his lines. Next to Shakespeare and Whitman (ahead of even Keats! 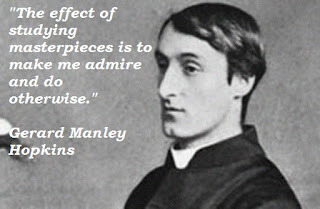 ), Hopkins may be my favorite poet. I look forward to spending some of my coming spring days with him, perhaps feeling his words (to quote him) "stealing as Spring through [me]." 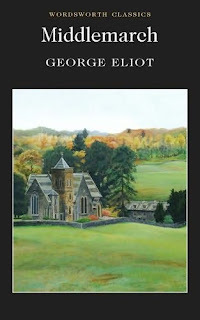 Delycia and I are continuing to enjoy George Eliot's Middlemarch. It's a very long book, and I often get lost among the many confusing characters and sub-plots, but Delycia helps to straighten me out. 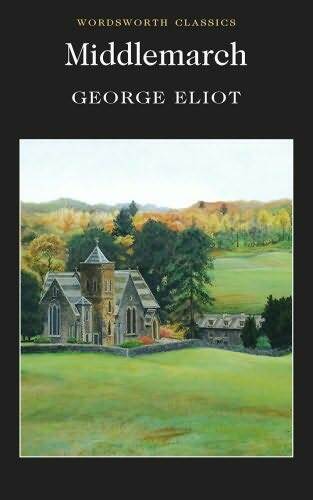 The book, unlike Eliot's other novels, has very little of what we would call "excitement" in it -- very little rising action and tension. Instead, it's a quiet, accurate picture of life the way it probably was in a typical English village in the 1830's. This surely accounts for the "dullness" I sometimes see in some of the chapters, for no doubt a certain amount of dullness is commonplace among the lives of everyday people. Eliot seems to be seeking real life in these pages, as opposed to simple melodrama.